For those iOS faithful out there with an Apple iPad that use the Bing for iPad app, you just might like to know that Bing for iPad has just been given an update to version 1.1 that comes sporting an interesting new feature called Lasso, a feature that apparently makes copy and paste for searching easier. 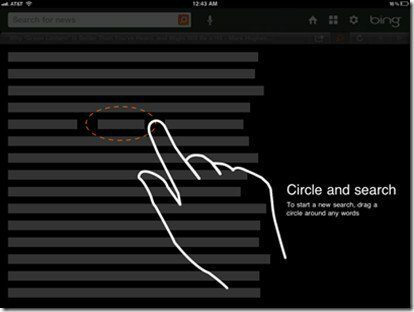 According to an article Ubergizmo by way of Bing, the new Lasso feature is designed for touch friendly devices and is a new way to search with your finger. Apparently it currently takes nine steps to copy and paste text on the Apple iPad and the new Lasso feature chops this down to just two. So how does the new Lasso feature in Bing 1.1 app for the Apple iPad work? Well apparently all the user needs to do is use their finger to draw a circle around a specific term they wish to search for, much like lassoing it, and the app will launch a new search with the lassoed word, thus the user no longer needs to press and hold their finger on the screen to copy text. Apparently the Bing guys say that this is only the beginning with the Lasso feature moving Bing beyond the search box, although initially the new feature will only be available for the Apple iPad, but they are considering taking the Lasso feature further in the future. So perhaps at some point in the future we could well see Bing with Lasso come to Windows Phone 7 devices, although that is of course pure speculation at this point in time. For those that user Bing for iPad, they can download the updated iOS app from iTunes for free as of right now as long as your Apple iPad is running iOS 4.2 or above of course, and so you can find out all about Bing for iPad 1.1 we have a promotional video below for your viewing pleasure, so don’t forget to check that out, and naturally if you do download and use Bing for iPad 1.1feel free to let us know how well it works for you or if you experience and problems by posting to our comments area below…enjoy the video.